The Mini-Me of Planers Cbyrneiv Showed You His, Now You Show Us Yours! My first thought when I saw this magnetic wrist band was to question its usefulness. Then followed by a burst of giggles as it brought forth images of former Teen Titan Magenta’s magnetic evil superpowers. After a moment, though, I could think of times when the Magnogrip could have come in handy. It makes more sense than chipping a tooth holding screws in the only other available place. The manufacturer guarantees that the Magnogrip will securely hold nails, screws, drill bits, fasteners, and even tools. It’s made of durable heavy duty canvas, industrial grade velcro, and high-powered magnets that are, according to the manufacturer’s website, strong enough to hold a hammer. I’m not sure that I’d feel all that confident with a hammer magnetically connected to my wrist, considering that my toes are sure to be right underneath it, but perhaps there’s a use for this when a pocket or tool apron — or your mouth — wouldn’t be as convenient for holding smaller objects close at hand. 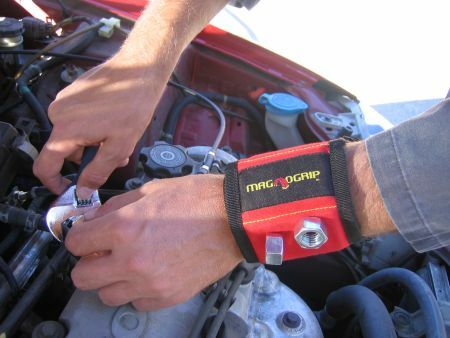 The Magnogrip is 3.5″ wide and fits wrists up to 12″ around. One site which reviewed it suggested that it could be useful in the computer repair field, but this computer geek knows better than fool around inside the box with a whonkin’ big magnet attached to my wrist. (Data? What data?) But for tinkering elsewhere — and with a street price starting at around $11 — it might be worth a try. Note: This looks a little larger and more powerful than the “Super Wrist Mag” which we wrote about last year. Maybe this one will fare better in actual use. I would find this very annoying. What’s next – a magnetic headband? I spent some time installing big industrial curtains in warehouses to divide up areas (they’re like 13′ high by 24′ long). I made a magnetic wristband on the cheap to hold the set screws for holding the curtain tracks together. Came in handy (wristy?) when you’re up on the lift.